OTTAWA -- Kelly Craft's first acts of public diplomacy in Canada involved quoting John F. Kennedy -- a Democrat -- and acknowledging the country's collective loss of Gord Downie. Craft became Trump's new U.S. ambassador to Canada, but offered a reference to Kennedy -- the only deviation from her carefully scripted and delivered public remarks -- after she formally took office Monday, becoming the first woman to ever occupy the role. "If I may echo the sentiments of President Kennedy, I truly feel amongst friends," she said after joining several new diplomats who submitted their credentials to Gov. Gen. Julie Payette at Rideau Hall. "It is clear that he deeply loved Canada; his poetic voice fell silent too soon," she said. "He once said that in recent years, it was hard for him to leave a song without a glimmer of hope. He viewed art, his music and his writings to help bring people closer in. I believe this is important business that we should all be about." As Trump's ambassador, she is likely to find herself negotiating some tough issues with her Canadian hosts, including the NAFTA renegotiation and climate change. She has also expressed support for the president's trade agenda, which involves renegotiating or cancelling NAFTA. She professed to be "a great listener" who will work to protect the economic relationship between the two countries. "I am committed to continuing our collaboration to address security at the border," she said. "But, I also want to make sure we continue to make it easier to engage in cross-border trade and travel." "It's in our interest to take her in and embrace her, and have her become, in a sense, our best advocate," Robertson said. With the latest round of NAFTA talks exposing a wide gulf between the U.S. and Canada, Robertson said Ottawa needs to cultivate Craft as a pipeline for Canada to the White House, said Robertson. That's especially important, he added, because relations appear strained between Foreign Affairs Minister Chrystia Freeland and U.S. Trade Representative Robert Lighthizer. Freeland and Craft exchanged smiles and good wishes in the minister's office on Monday afternoon with the envoy saying she looked forward to strengthening relations between the two countries. Freeland told Craft that she knows "first hand" that she is extremely well respected in the U.S.
"Isn't it great that we now have the first woman ambassador from the United States." 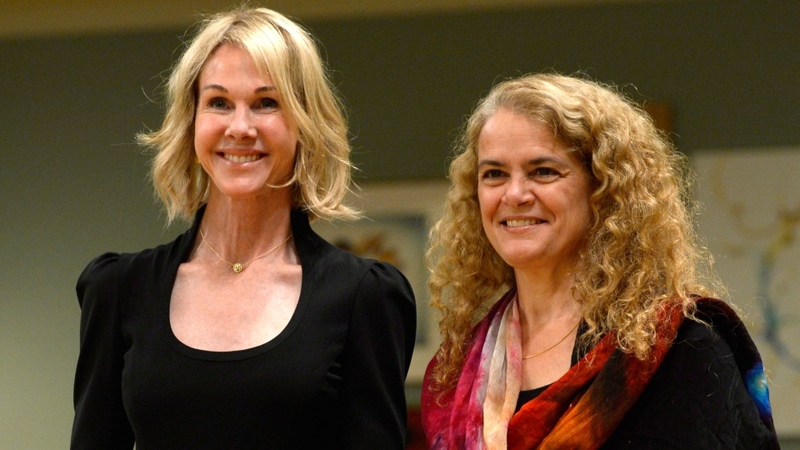 Payette, who was presiding at her first ceremony to welcome new diplomats, also told Craft it was "a pleasure to welcome you as the first female ambassador of the United States to Canada." Roland Paris, Prime Minister Justin Trudeau's first foreign policy adviser, said Craft faces the tough task of representing a president who is unpopular in Canada. "It won't be easy to put a kinder and saner face on this administration," said Paris. "Among other things, she will be asked to explain why President Trump seems inclined to treat Canada, America's closest ally and friend, as an economic adversary rather than as a partner." Craft got cracking on that job Monday, declaring: "It is a privilege to represent the United States in Canada and to be entrusted with the responsibility of working so closely with such an important friend, ally and neighbour." She is also close with Senate Leader Mitch McConnell, one of the country's most powerful lawmakers, who also hails from her state. McConnell has occasionally bickered with the president, whose anti-establishment, trade-skeptical, more combative stance has put him at odds with the party's establishment. Paris said it will be difficult at times for Craft to represent her president to the Canadian government, "given the confused state of the Trump administration." The new U.S. Ambassador to Canada Kelly Craft formally submits her credentials to Gov. Gen. Julie Payette at Rideau Hall on Monday, Oct. 23, 2017.